Summer is the perfect time for salads! Try substituting spinach and mixed greens for bread or high calorie wraps - put your favorite sandwich ingredients (egg salad, chicken salad, BLT, tuna, etc.) in a salad. Or wrap the ingredients in a large lettuce leaf. Steak salad: cut your leftover steak into strips and put it over spinach and mixed greens (stay away from iceberg lettuce - very low nutritional content). Add your favorite extras: tomato, onion, avocado, cucumber, zucchini, artichoke, carrot, celery, chickpeas, sunflower seeds...the possibilities are endless. Top with a bit of olive oil and balsamic vinegar. (Stay away from pre-made dressings that say "fat free" and are high in sugar/carb content). Enjoy and have a healthy summer! Combine water, bouillon, and salt in large saucepan; bring to a boil. Stir in quinoa. Cover, reduce heat, and simmer 15 minutes. While that is simmering, cut up mushrooms, pepper, and tomato. Heat oil in medium skillet over medium-high heat. Add mushrooms, red pepper, and wine. Cook 2-3 minutes. Add tomato and black pepper; reduce heat. When quinoa is done, add vegetable mixture to the saucepan and mix well. If desired, spoon walnut over the top before serving. In a large bowl, combine the bread crumbs, eggs, onion, basil, parsley, garlic, and pepper. Blend well. Add the ground turkey and sausage. Using fingers gently mix all the ingredients until thoroughly combined. Using a 1-ounce cookie scoop or a small ice cream scoop, form the meat mixture into 1-2 inch balls (about 22 to 24 meatballs). Place meatballs into a large oiled skillet and cover. (I recommend grapeseed or safflower oil). Tun 1/2 way through and cook until brown all the way through. (Total time will be about 20 minutes). Brown sausage / cook bacon; drain well. Preheat oven to 350. In a bowl, beat eggs. Add onion, green peppers, salt, pepper, and garlic powder. Stir in sausage and cheese. Grease muffin pan (do not use paper liners). Spoon 1/3 cupfuls into muffin cups. Bake at 350 for 20-25 minutes or until a knife inserted in the middle comes out clean. Note: if you want to change ingredients, do an equal substitution. Ex: 1/2 cup mushrooms instead of 1/2 cup green pepper. Otherwise, you'll end up with excess mix that will not fit into the muffin cups. Mix peanut butter and milk together, then add dry ingredients and stir until well blended. Shape into balls. Place on a cookie sheet and put in the fridge overnight. Enjoy as a snack! Peel and slice banana; freeze for 1 hour or as long as you can. 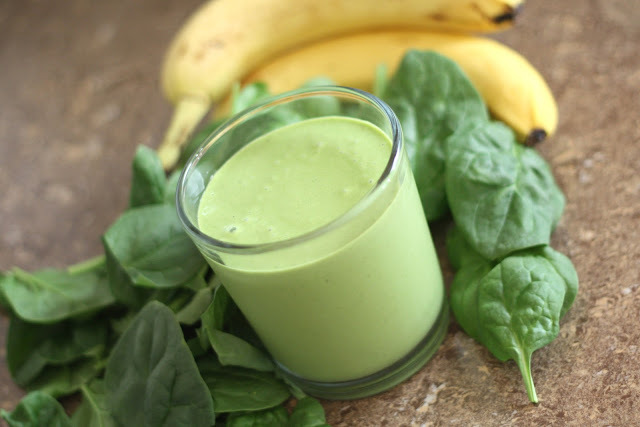 Place all ingredients in a blender and enjoy! **Snacks with a protein source will the best option for a healthy diet. Enjoy! Mix everything together in a bowl. Chill 1 hour before serving. 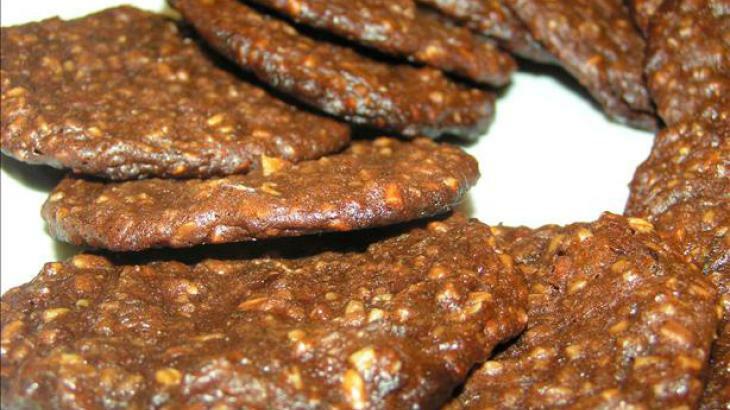 Eat 'as is' for a low carb snack, or eat with a few whole wheat or whole grain crackers. Place chicken breasts in slow cooker. In a large bowl, combine tomatoes, green chiles, green pepper, and all spices. Pour over chicken. 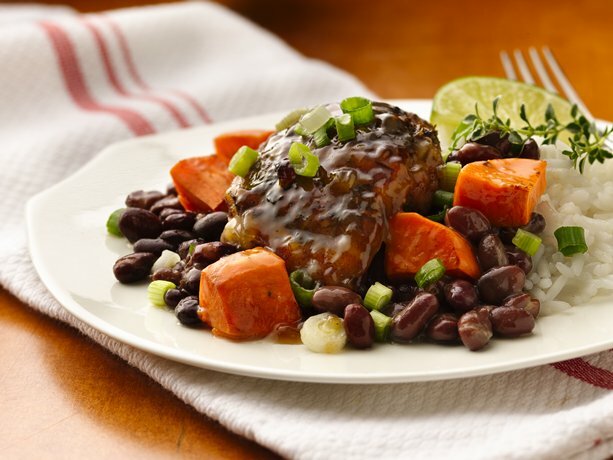 Cook in slow cooker for 5-6 hours. Shred chicken (can be done with 2 forks right in the slow cooker). Stir in beans, corn, tomato juice / sauce, cheese, and sour cream / yogurt. Cook for another 10 minutes in slow cooker, until heated through. Get ready for a surprisingly delicious treat! Heat oven to 375. In small bowl, mix salt, allspice, thyme, and red pepper. Pat chicken thighs dry with a paper towel and rub mixture on all sides. Heat oil in skillet over medium-high heat and cook chicken 2 minutes per side. In greased baking dish, layer beans and potato. Place chicken on top. In small bowl, mix honey, lime juice, and cornstarch; add to warm skillet. Heat to boiling, stirring constantly. Pour over chicken. Bake 35-45 minutes or until chicken is 180 degrees. Sprinkle with green onions before serving. Pre-heat oven to 325. Mix applesauce and peanut butter together. Mix in dry ingredients, stir well. Add raisins. Using 2 spoons, scoop 24 cookies onto a GREASED baking sheet. Bake for 10-12 minutes. NOTE: these will not flatten like other cookies because there is no butter/shortening in them. Do NOT overbake. Have a cookie with a protein shake for a quick, easy, nutrient rich breakfast. Pre-heat oven to 350. Cut the sqaush in 1/2 lengthwise. Scoop out the seeds in the middle. Put in a pan, cut sides down, with a bit of water. Cook squash for about 45 minutes, until the skin can pierced easily with a fork. While the squash is cooking, brown the beef and mix in the pasta sauce. Heat the corn. Use a fork to scoop out the squash, it should be stringy like noodles. Serve the sauce mixture over the squash. The corn can be served on top or on the side. **For an even lower carb option, you can reduce the serving of corn and use fresh diced tomatoes with italian seasoning and garlic as a substitute for the pasta sauce. Or instead of corn, serve with a spinach salad with olive oil and vinegar. If you are running low on time, you can 'jump start' the squash by microwaving the halves for about 5 minutes while the oven warms up. Nutrition: Each serving is 1 cup squash, 1/3 lb beef, 1/2 cup sauce, & 1/2 cup corn. Brown ground beef. Dice tomato and green pepper while beef is cooking. Add taco seasoning and water. Add all remaining ingredients except cheese. Let simmer for 5 minutes. Sprinkle with cheese just before serving. 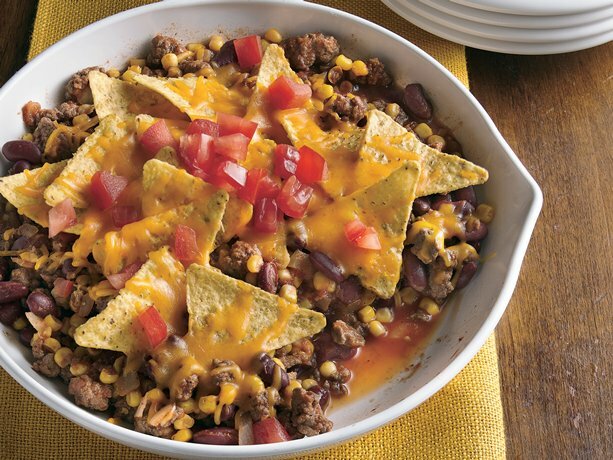 Eat 'as is' for lower carbs, otherwise this dish can be served with tortilla chips. Pre-heat oven to 375 degrees. Mix all ingredients in a large bowl. Form 10 cakes with a large spoon and place on a non-stick 9x13 pan. Bake for 15 minutes. Serve with a vegetable, such as a fresh spinach salad. Pair this with your favorite fresh or frozen vegetable, such as steamed broccoli and a small, baked red potato.